There are certain public events that help define Lowell. Some, like the first time the National Folk Festival was in Lowell or the first game played by the Lowell Spinners baseball team, you expect to be memorable. Others sneak up on you. 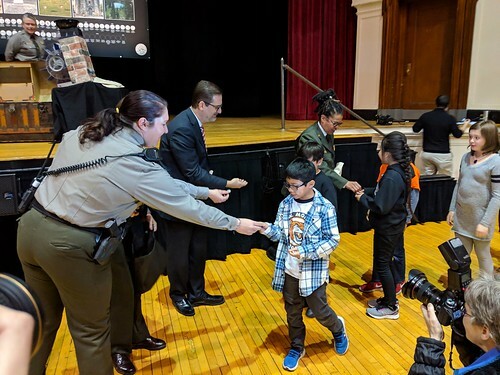 That’s what happened Wednesday with the Lowell National Historical Park Quarter Launch event at Lowell Memorial Auditorium. The event was amazing, fun, inspirational and invoked all the elements that have made Lowell an important place in American history and a great place to live. This all began ten years ago with Ellen Anstey, a staff member at the Tsongas Industrial History Center. She learned of the forthcoming America the Beautiful Quarters program by the United States Mint, a twelve year program that honors one national park or historic site in each state or territory. She convinced others that Lowell should pursue this honor and has been intimately involved in the process ever since. 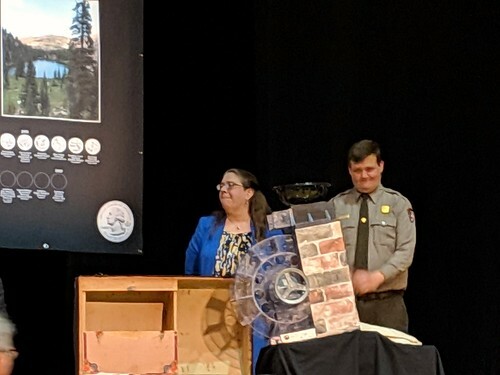 All the effort paid off and the U.S. Mint chose Lowell National Historical Park as the Massachusetts site to be honored on one of the America the Beautiful quarters. Park Ranger David Byers was also singled out for his untiring efforts to bring the quarter to Lowell. By 10am on Wednesday, the Auditorium was packed. 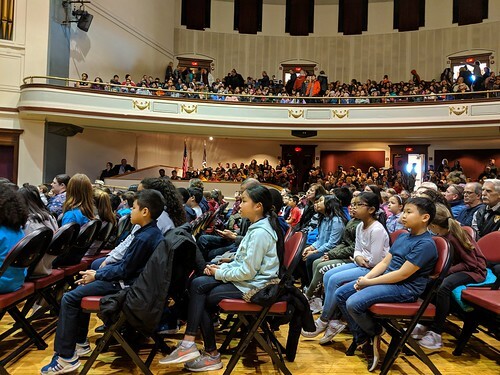 Every fourth grade student in the Lowell Public Schools was there and all other seats were taken by residents of Lowell and neighboring communities. People must have sensed the historic nature of the event because there was a buzz in the room before the program even started. Adding to the energy was the Lowell High Band which played musical numbers appropriate for the occasion. The colors were presented by the Lowell High Air Force Junior ROTC Honor Guard, the National Anthem was sung by the Lowell High School Chorus, and the Pledge of Allegiance was led by Eunice Tabea, the Lowell High Senior Class President. This last thing – the Pledge of Allegiance – deserves special mention. Usually in a big crowd people murmur through the Pledge of Allegiance. This was very different. The recitation echoed loud and clear through the Auditorium. Perhaps it was the voices of all the fourth graders; maybe everyone else sensed the importance of the occasion. But whatever it was, the rendition of the Pledge was stirring, one of the best I ever recall. 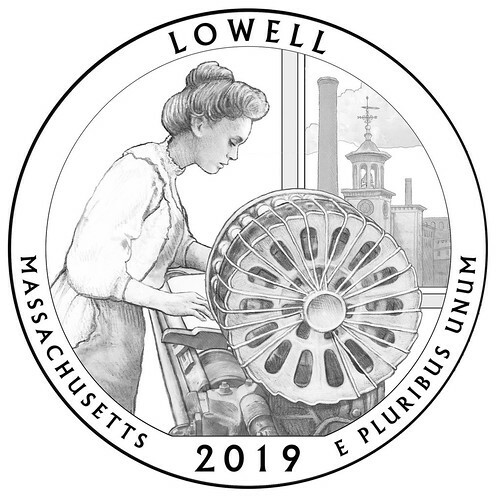 Rivaling the Pledge of Allegiance in stirring moments was the audio-visual collage created when the Lowell High Band played “Mills on the Merrimack” while a locally produced (by NPS’s Andrew Donovan) video of women working in the mills ran on the big screen at the front of the room. In keeping with the celebration of women depicted in the quarter’s design, the concise speaking program featured women from or connected to Lowell including National Park Superintendent Celeste Bernardo, former Congresswoman Niki Tsongas, UMass Lowell Chancellor Jacquie Moloney, City Manager Eileen Donoghue, Community Teamwork CEO Karen Frederick, Coalition for a Better Acre Executive Director Yun-Ju Choi and National Park Deputy Regional Director Rosalyn Fennell. 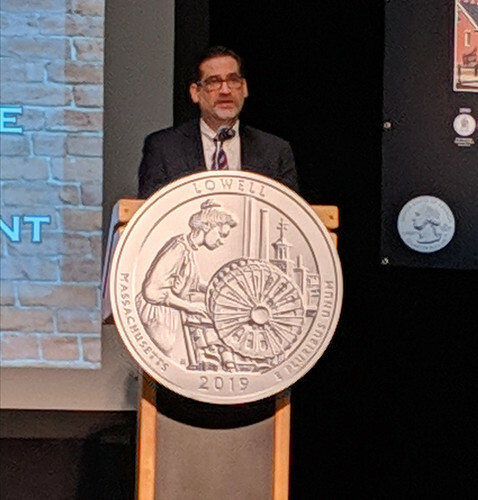 Marc Landry, the Acting Associate Director for the Numismatic and Bullion Directorate of the Mint, was on hand representing the U.S. Mint. I had a chance to speak with Mr. Landry beforehand and learned that he was especially eager to participate in the Lowell event because his grandfather was born here, the child a French Canadian immigrants. The grandfather moved to Pontiac, Michigan in the 1920s and settled there and raised a family – including grandson Marc who now works for the U.S. Mint and who had never had the chance to visit Lowell prior to this week. Mr. Landry explained that the U.S. Mint handles circulating coins, numismatic (collectible) coins, and bullion (investment grade coins of gold or silver). Each year, the U.S. Mint produces 16 billion new coins. This year’s run will include 389 million Lowell quarters. The Lowell quarter is the 46th released in the America the Beautiful series and the first of five to come out this year. The design of the Lowell quarter was created by artist Joel Iskowitz and was sculpted by Phebe Hemphill, one of the Mint’s sculptor/engravers. The coin has three components. In the foreground is a woman working at a power loom. She represents the working women of Lowell from the mill girls of the 1820s to immigrant women of today. The second component, also in the foreground, is a large wheel called a “bobbin changer.” This was a technological innovation that saved time and increased output. It symbolizes the importance of innovation in Lowell’s history. The third component of the coin is the view of the Boott Mills in the background. The clock prominently shown on the tower of the mill reminds us of how the Industrial Revolution changed the concept of time. Once measured by changes in the seasons, the Industrial Revolution demanded more precise measurement of the passage of time. Jacquie Moloney reminded everyone of the success of the 40 year partnership between UMass Lowell and the National Park that has given us the Tsongas Industrial History Center which is a national model of experiential learning. With that, the final act of the program began: the amazingly orderly and well-orchestrated distribution of a free Lowell quarter to everyone age 18 or younger in attendance, and the opportunity for everyone to redeem other U.S. currency for one or more rolls of brand new America the Beautiful Lowell quarters on the coin’s first day of issue. 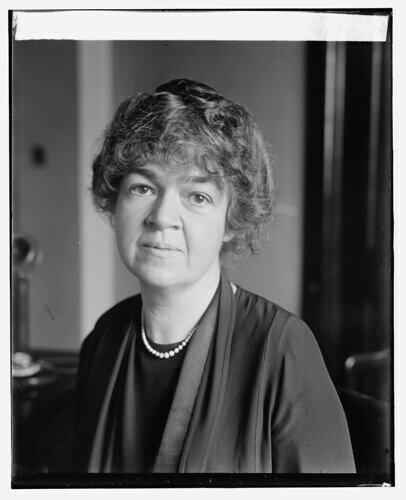 At the Quarter Launch event, Niki Tsongas cited the many ways in which Lowell was a centerpiece in the “abiding drive for equality by women in America.” An example she cited was Edith Nourse Rogers who was elected to Congress in 1925, just five years after women won the right to vote in America. This was also a reminder that we are right now in the centennial year of women winning the right to vote in Massachusetts which happened in 1919. There is actually an organization in Massachusetts – Women’s Suffrage Celebration Coalition of Massachusetts – that is dedicated to commemorating and celebrating the centennial of women gaining the right to vote in collaboration with other organizations across Massachusetts and the nation. From the mill girls of the 1820s to the impressive number of women in local leadership positions today to our new Lowell quarter, it would seem like this city would be a prime venue for organizing and conducting one or more events to recognize this important anniversary. Hopefully people will come together and make that happen. Last Sunday I wrote how Lowell property owners have contributed more than $5 million dollars to the state’s Community Preservation Trust fund and have seen all of that money distributed to other communities with not a penny coming back to Lowell. That’s not the fault of the Trust Fund because it’s up to us, the people of Lowell, to make a claim on that pool of money. The Community Preservation Coalition, a partnership of non-profits and agencies that helped enact the CPA back in 2000, has an excellent webpage that explains the process of adopting the CPA and provides assistance to communities who seek to do that. Simply put, the Community Preservation Act must be accepted by a majority of voters in a ballot referendum. The question would get on the ballot either by a majority vote of the city council or by the filing of a petition containing the signatures of 5 percent of all registered voters. The vote to enact the CPA then imposes a surcharge on local real estate taxes of either 1, 2 or 3 percent (the amount is specified in the vote). The money raised through that surcharge is then matched from the state’s trust fund and the total amount of money is then devoted to preservation of open space, creation of recreational opportunities, preservation of historic structures, creation of affordable housing, or some combination of the four. Because the state’s matching funds are raised through a surcharge on documents recorded at the registry of deeds, we are already paying for the fund while receiving no benefits from it. Hopefully someone will take the lead on changing that. I was pleased to learn that Congresswoman Lori Trahan signed on as a co-sponsor of the Green New Deal. The lead sponsors of this plan are our own U.S. Senator Ed Markey and Congresswoman Alexandria Ocasio-Cortez of New York. 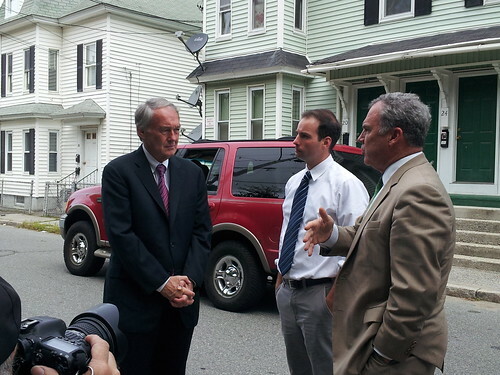 I’m also pleased that Senator Markey has taken the lead on this measure. From his very first day in Congress back in 1977, he’s been a strong advocate for protecting our environment. He played a particularly important role locally in the investigation of the W.R. Grace toxic waste disaster in Woburn. Those of you who ride commuter rail into Boston may be familiar with the Anderson Woburn stop. That transportation hub is the site of a Superfund cleanup (Markey was the chief architect of the EPA’s Superfund). It is named for Jimmy Anderson, one of the children who died of leukemia following exposure to the contaminated waste that was dumped there. Besides being good for our environment and our economy, taking a lead on this and partnering with Rep. Ocasio-Cortez is good for Markey politically since he will be up for re-election to the Senate in 2020. 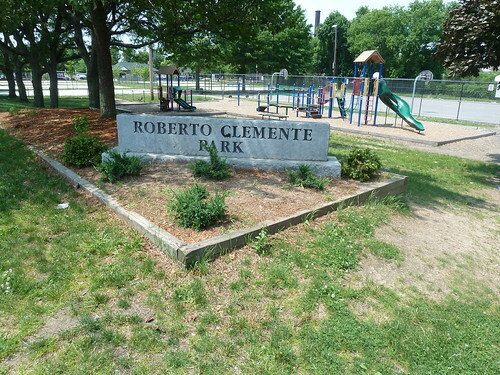 At last Tuesday’s city council meeting Councilor Rodney Elliott made a motion to request the council’s Parks and Recreation Subcommittee discuss the possible renaming of Clemente Park on Middlesex Street to Pailin Park. This was considered a year or two ago, but the council decided that further outreach to the Latino community of Lowell was needed. That’s been done with the baseball fields at the Bartlett School being renamed Roberto Clemente field. The park on Middlesex Street has long been a center of social and community life in the Cambodian community so it seems fitting to change its name to reflect that. The park does have a fascinating history which I wrote about several years ago.